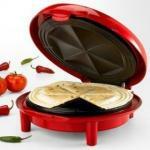 A quesadilla maker? Really? Is it that hard to make a quesadilla? Is it that time-consuming? One-purpose items are generally prohibited in my kitchen. (My salad-spinner is the one exception that leaps to mind.) And if a product is going to do only one thing, it needs to do it well.